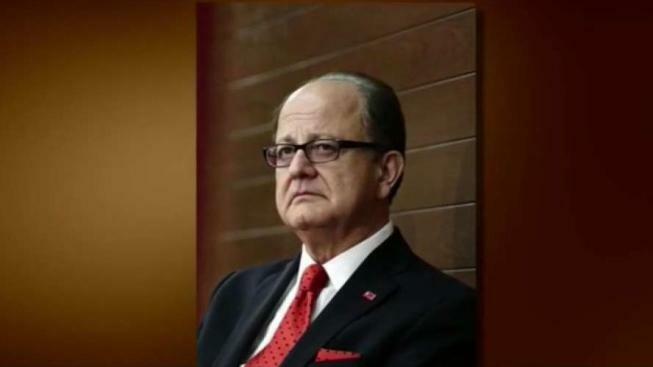 The USC president is stepping down effective immediately Tuesday in the wake of sexual assault allegations against a campus doctor, according to the school. C. L. Max Nikias will move into the role of President Emeritus and Life Trustee of the University, said Rick Caruso, the chairman of the USC board of Trustees. "This decision follows the announcement, earlier this summer, that the Board of Trustees and President Nikias had agreed to an orderly transition and that a Special Committee of the Board would commence a search for a new president," Caruso said in a statement. "Amongst other responsibilities, Dr. Nikias will continue to assist with the transition of the incoming president. The board has appointed Wanda Austin, a member of the board of trustees and an engineer who was president and CEO of The Aerospace Corporation, as the interim president. She will be in place while the board conducts a search for its 12th president. Nikias faced pressure to resign following accusations of sexual misconduct against former gynecologist George Tyndall at the school's student health center. "The board and I are committed to an ambitious, aggressive agenda for change," Caruso said. "As I have said previously, it is evident that the recent crises have resulted from systemic and cultural failures. Both the behavior and the environment that allowed it to persist are inexcusable and will no longer be tolerated." The move comes after four former University of Southern California students sued the school and Tyndall who they accuse of molesting patients over decades as a "serial sexual predator," according to a court filing Monday. Tyndall routinely made crude comments, took inappropriate photographs, forced the plaintiffs to strip naked and groped them under the guise of medical treatment for his "sexual gratification," the lawsuit said. "It occurred because students, faculty and alumni pressured Board of Trustees to do the right thing," the statement said. "It is our hope that their pressure will continue until the University reforms the culture which has enabled sexual abuse and holds all of the enablers accountable so this will never happen again." The scandal involving Tyndall and his removal -- which the university acknowledged publicly in response to a months-long investigation by The Times -- was the third involving doctors tied to USC that came to light in the past year. Former dean and longtime USC fundraiser Dr. Carmen Puliafito was fired by the school last August the wake of the newspaper's report that he abused heroin, methamphetamine and other illegal drugs, including on days he worked as an eye doctor in university facilities. The Times also reported that a 21-year-old prostitute overdosed while taking drugs with Puliafito at a Pasadena hotel and accused the university of turning a blind eye to complaints about the dean. Puliafito's replacement, Dr. Rohit Varma, resigned in October as the newspaper was preparing to publish a story disclosing that he had been formally disciplined by USC in 2003 following allegations that he sexually harassed a young researcher while he was a junior professor supervising her work. Following the revelations about Tyndall, Nikias apologized in writing to women who said they were abused by the doctor. He also released an "action plan" to address problems and put better safeguards in place, while saying he was struggling to understand how the doctor was allowed to continue treating patients for decades and noted his two daughters were USC students. Caruso said the university has already hired education-recruitment firm Isaacson Miller to lead the search for a new president. The university has also retained the international search firm of Heidrick & Struggles in an "advisory capacity" to assist with the search, Caruso said. The Board of Trustees has also formed a Presidential Search Advisory Committee that is expected to solicit public input through "listening sessions" and the establishment of a presidential search website. Caruso said he hopes to have the search completed in four to six months. "As I have said before, it is critical that this process embraces your perspectives to help guide the committee in identifying the most qualified and talented person to lead our university forward," Caruso wrote in his letter.